Mood: Enhanced reality is fundamentally changing my morning workouts. Soundtrack: Panic! at the Disco "Death of a Bachelor" and "Too Weird to Live, Too Rare to Die"
Pokemon Go is doing interesting things to my runs. I find myself running to spots where I've had good luck catching rare Pokemon in the past and then stopping and pausing to see if I can find more. Mostly I'm NOT playing on runs, but in certain sections I definitely pull out the game and run from Pokestop to Pokestop to fill up on helpful items and catch the cool Pokemon. I got some good stuff on this run, and hit up enough Pokestops that my item bag was full by the time I was done. Also, I had a great run, but those two things seem to have almost happened at the same time but completely separately. I know this game is basically the 2016 version of the Pet Rock, and someday we'll all look back on this nonsense and laugh, but right now, I'm all about catching em all...you GOTTA catch em all. I also found it interesting that the grass goes right up to the sculpture in this photo, and my photo from today clearly has this sculpture sitting on some type of asphalt. Was the sculpture moved? How old is the sculpture? 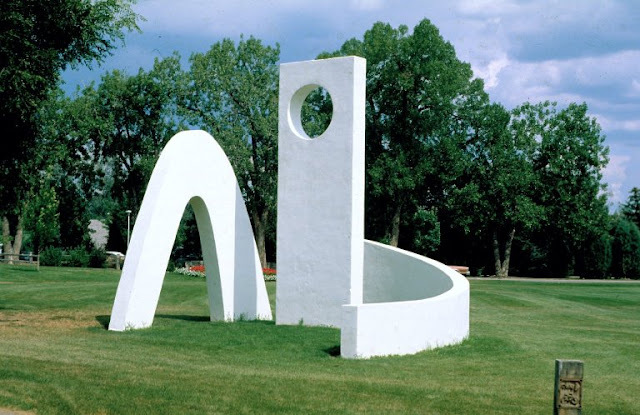 Then I googled "Gallup Park Sculpture Littleton Colorado" and found THIS article which told me that the sculpture was made in 1976 and very recently restored.